I’m in Houston this weekend for a cousin’s baby shower. Robby bravely stayed with the kids Sat-Mon! I do have to say that flying without a toddler is something that should be treasured. I love my Ella and bringing her to see family, but sitting still for two hours on a plane is not high on her priority list. Plus the shower was at a country club so not kid friendly. Here is my lap minus a toddler on the plane :). I subscribe to Atlanta Mag on my ipad through Newsstand and LOVE it. Saturday getting out of town was a serious juggling act! It went like this…wake up at 5:45, clean up inbox, make Connor big breakfast for SSAT, get him to SSAT by 8:30 after squeezing in a shower, come home pack and get ready, go to G and W’s basketball game that R is coaching, leave straight from there to pick C up from test, go straight to a high school open house, leave straight from there for the airport. Whew! I slept good that night. This Eliza J dress is what I wore for the open house and travel. It is so comfortable and fun. This particular one is sold out but I linked another super cute one here. I put a navy gingham button up under it, which would also work great for the one I linked! This is how I wore it with tights when outside…more posts coming on these booties and backpack! This necklace is close to my favorite purchase so far this year (so what we’re just 10 days in?). 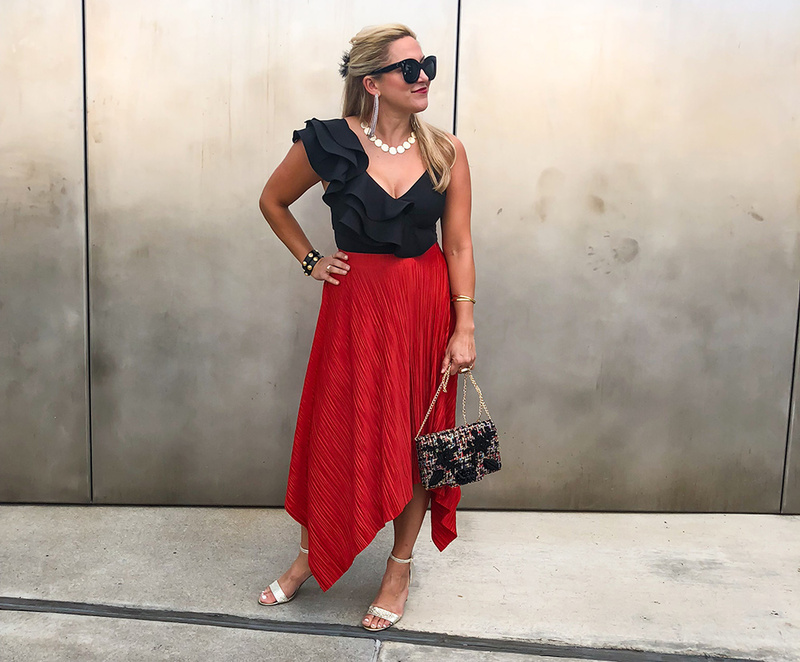 I love my accessories and this one is so perfect for really jazzing up a casual ensemble or being the finishing piece to something a little dressier. I’ll be wearting this on repeat! I always miss Texas and family when it’s time to leave. Houston has grown and changed so much since I lived here, but it will always feel like home.